18 Feet & Rising’s ambitious campaign #MarchforGiants (March 23 to March 26 2017) will see a herd of 3D virtual elephants transcend global borders as it parades across giant outdoor advertising screens in three continents. Developed by 18 Feet & Rising and powered by UK media owner Ocean Outdoor and its Alliance partners, the campaign is designed to raise funds for Space for Giants, a conservation charity working across Africa with a mission to protect half of the continent’s remaining 380,000 elephants by 2020. Starting from Space for Giants’ fundraising webpage, 18 Feet & Rising has developed an online campaign hub that will stream to five outdoor screens and reward supporters’ engagement in real time – whether at home, on the commute, or stood in front of one of the DOOH spaces around the globe. 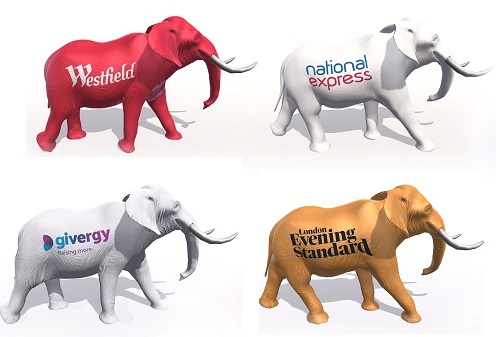 “Each elephant generate is sponsored, and decorated in corporate liveries and donors' names, all supported in social and broadcast media by a network of celebrities, social influencers and international news networks across the globe,” says 18 Feet & Rising creative director William Thacker. #MarchforGiants is a worldwide media first and to make it happen, 18 Feet & Rising has assembled a crack team of 3D specialists, games developers and digital producers. DOOH.com, Popped and Freefolk have given their expertise and time for free. “This is the world’s first worldwide dynamic OOH advertising campaign. A campaign that is so responsive that when you donate in front of the screen, your elephant is born into the virtual world and on to that screen before your eyes,” said Andrew Phipps Newman, CEO DOOH.com. Digital integration is central in taking #MarchforGiants from single to multi-channel. Consumer insight is key at the point of engagement to ensure each donor’s involvement is easy. Once an elephant is born into the virtual world it literally travels around the globe in four days, appearing in multiple cities. Hero™ closes the social media loop with a picture of each elephant on each screen as it dominates each city. This picture is shared with donors with an easy “one click” share to their favorite social media channel, the perfect mechanic for this campaign to grow organically. The biggest challenge is to live stream a different virtual window from the virtual online world to Ocean’s screens in the real world. Digital agency Popped has developed different mechanics to generate public donations across different continents, overcoming local regulations and technical issues in each territory. “The main requirement was simple; make it quick and easy for people to donate and receive personalised payback both on public screens and through rich social sharing opportunities,” said Popped’s digital creative director Shaun Sahdev. The 3D elephants are created by visual effects experts at Freefolk. The usual process is to build the models, create textures for them (often sourced from photographs of the real object) and choose the lighting. The model is then sent to a large collection of PCs, the "render farm", which produces the final images in high quality. A single, complex image can take up to an hour. But because this project runs in real-time, producing 30 frames or so a second requires a different approach, adapting techniques more commonly used in video gaming but without sacrificing the resolution and texture of the 3D generated elephants. 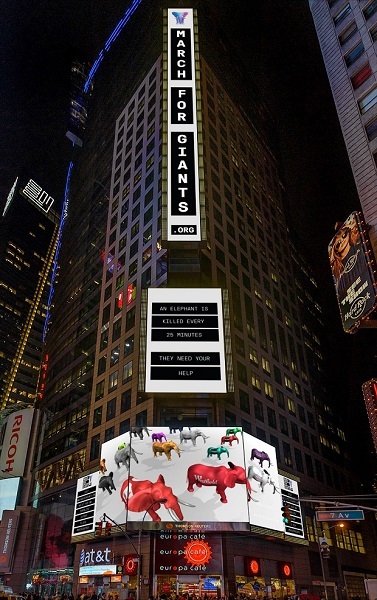 March for Giants was an international winner in Ocean’s annual creative digital competition, which sets out to push the creative and technical boundaries in digital out-of-home. Supported by corporate donors and individuals, the herd is released in Hong Kong on the new CTV screen in Tsim Sha Tsui at 7pm local time (11am GMT), reaching the Thomson Reuters screen in Times Square New York at 7pm (EST) on March 23, arriving in Westfield Stratford City, London at 8am on March 24. The herd then heads North to Birmingham reaching the giant Media Eyes positioned above Grand Central station and shopping centre from 8am on March 25, reaching its final destination at Manchester Printworks from 8am on March 26.